Starting in the earliest days of powered flight, Aerospace Bristol will whisk you away on an immersive journey through more than a century of incredible aviation achievements and fascinating tales of human endeavour. From bold pioneers taking to the skies in their magnificent flying machines, to the remarkable men and women who played their part in two world wars, to those who dreamed a seemingly-impossible dream of supersonic travel: then created the iconic Concorde to turn that dream into reality. Your journey takes you from the beginnings of the British and Colonial Aeroplane Company in 1910 all the way through to the modern day, where you will explore cutting-edge technology, and look ahead to an exciting future, discovering how the next generation of engineers will continue to push aerospace technology to new heights and reach for the stars. 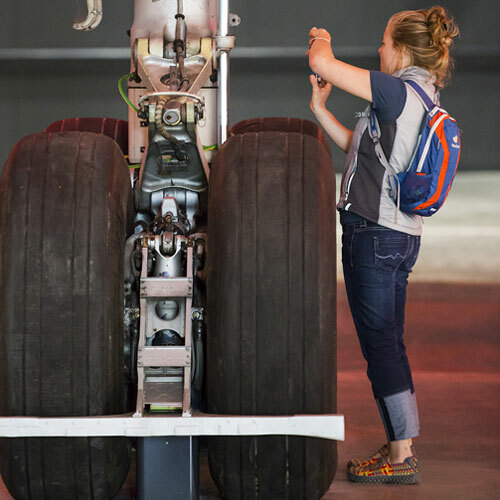 A visit to Aerospace Bristol is a chance to travel through the decades, enjoy fun interactives and amazing exhibits - including aeroplanes, helicopters, missiles, satellites, engines and more - and immerse yourself in a story of ordinary people achieving extraordinary things. The stunning centrepiece of your visit will be Concorde Alpha Foxtrot: the last of the iconic supersonic passenger jets to be built and the last to fly. Capable of crossing the Atlantic in under three hours, Concorde cruised at over twice the speed of sound and reached an altitude of 60,000ft. Her passengers would marvel at the curvature of the Earth and look up at a blue-black sky, as they travelled at 1320mph and sipped Champagne on the edge of space. Concorde Alpha Foxtrot in Aerospace Bristol's purpose-built Concorde Hangar. How did the engineers of the 1960s create an aircraft capable of supersonic speed but also able to carry over 100 passengers in comfort and style? What was it like to work on Concorde and how did Concorde engineers overcome the massive technical challenges involved? What was it like to fly Concorde alongside royalty and film stars? Or to take control of this incredible aircraft as a member of the flight crew? You will discover the answers to all of these questions and more. 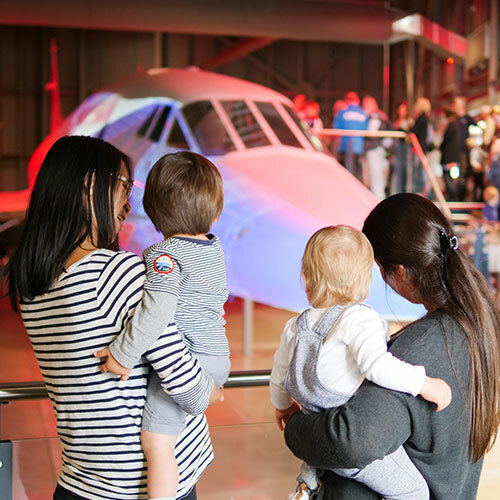 Bring your family to Aerospace Bristol and step aboard the last Concorde ever to fly. With aeroplanes, helicopters, rockets, satellites and hands-on activities, spend several hours with us and keep the whole family entertained. Let the kids run around whilst you relax with a coffee in our brand new outdoor play and seating area, all thanks to Enovert Community Trust. Book your tickets now and get ready to blast off on a journey through the history of flight with Aerospace Bristol. Download our Visitor Map ahead of your visit and get set for your journey through more than a century of aviation. While there are many smaller items in the exhibition, and interactive exhibits to enjoy, the following list details the large objects on display at Aerospace Bristol.